Farshid Moussavi is an internationally acclaimed architect and the founder of FMA, a London-based international architectural practice. Among its completed projects are the acclaimed Cleveland Museum of Contemporary Art in Ohio, the 13th Venice Architecture Biennale installation ‘Architecture and its Affects’ and the Victoria Beckham Flagship Store in London. Before forming FMA, Farshid Moussavi co-founded Foreign Office Architects (FOA) where she co-authored the design of many award-winning projects including the Yokohama International Ferry Terminal in Japan, the Meydan retail complex in Istanbul, and the Carabanchel social housing complex in Madrid. Moussavi is the author of The Function of Ornament (2006), The Function of Form (2009) and The Function of Style (2015), based on her research and teaching at Harvard. She serves on design and architecture advisory groups internationally. She is a member of the Board of Trustees of the Whitechapel Gallery as well as The Architecture Foundation in London. 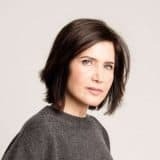 Since September 2011, Moussavi has been writing as a columnist for the Architectural Review magazine and, most recently in 2015, she was elected to be a Royal Academician by the Royal Academy of Arts in London.